Sixteen-year-old Quinn Hardwick’s having a rough summer. Her beloved grandmother has been put into a home, her dad’s gambling addiction has flared back up and now her worst enemy is back in town: Wesley James, former childhood friend—until he ruined her life, that is. So when Wesley is hired to work with her at Tudor Tymes, a medieval England themed restaurant, the last thing Quinn’s going to do is forgive and forget. She’s determined to remove him from her life and even the score all at once—by getting him fired. But getting rid of Wesley isn’t as easy as she’d hoped. When Quinn finds herself falling for him, she has to decide what she wants more: to get even, or to just get over it. 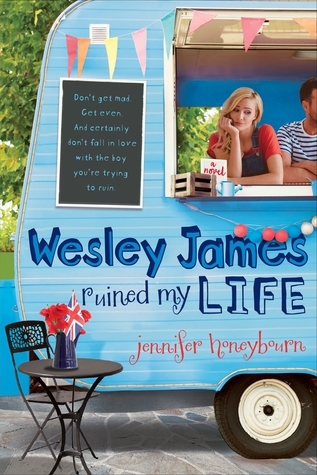 Wesley James Ruined My Life is another adorable addition to the Swoon Reads line. A quick and light read, Wesley James Ruined My Life is the perfect summer beach read. All Quinn dreams about is being able to visit England, her beloved grandmother’s childhood home. She wants this now more than ever since her grandmother is suffering from Alzheimer’s and her home life is not as perfect as it once was. However, while Quinn is working one day at Tudor Tymes to save up for her band’s London trip in the fall, the boy she blames her parents’ divorce on shows up again after moving away five years ago. And now that Wesley’s back? Well, Quinn is out for revenge. Quinn’s revenge plan was fun at first. I liked reading about the antics Quinn was getting up to in order to seek revenge on Wesley. Although as the plot went on, my enthusiasm for Quinn’s plans wore off. Wesley was too sweet of a guy to deserve any harm or ill will. Also Quinn’s reasoning for picking Wesley as a target wasn’t the greatest. Like I said, Wesley was such a sweet guy and I really liked when Quinn finally started to figure out she had feelings for him. I just wish there was more romance between the two! I also loved that Wesley James Ruined My Life focused on more than just the romance. One major storyline is Quinn learning to come to terms with her grandmother’s Alzheimer’s disease. I loved seeing the close relationship Quinn had with her grandmother and then the devastation that this disease brought upon Quinn. Her other family relationships were also an important part of the story, something that isn’t often touched upon in YA romances. Overall, Wesley James Ruined My Life was such a cute and quick read! I definitely recommend it for those looking for a fun YA contemporary romance on the lighter side, and I look forward to Jennifer Honeybourn’s next book! Great review, Jordan! I like how cute and light this sounds – perfect for the beach this summer! 🙂 Glad you liked it! I have been dying to read this one since I first saw it! Great review! Is the giveaway by you or are you just sharing it? I love the sound of this book, but I’m not sure if it’s out in the UK. I’ll have to keep an eye out for it! It just released in the US this week so hopefully it’ll be out on the UK soon!